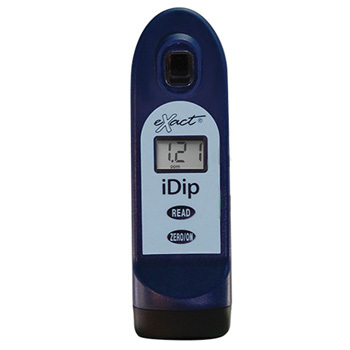 Dimensions: 6.5" x 2" x 1 3/4"
The new eXact iDip Water Meter is the best way to run a quick direct test to your drinking or pool water. 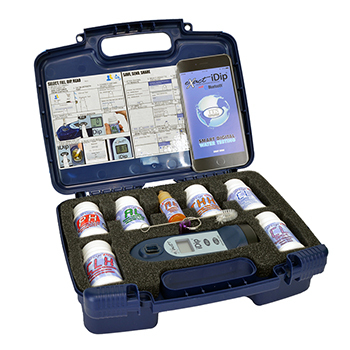 It tests your water for over 30 contaminants and syncs the result to a smartphone, utilizing its Bluetooth wireless technology. 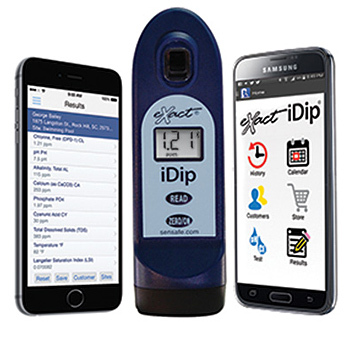 Test data is stored on a compatible smart handheld device such as Apple (iPhone, iPad, iPod Touch) or numerous Android devices. Results can be shared via email and a built-in GPS feature allowing easy retrieval by location. 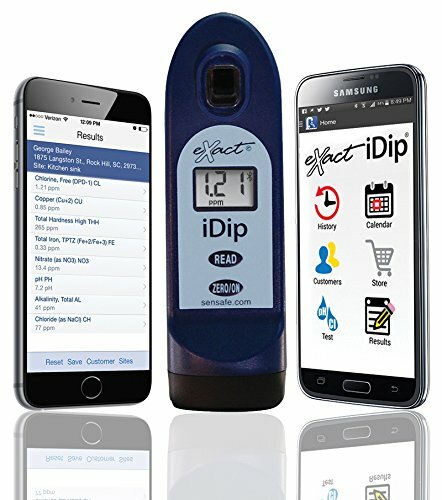 US EPA Compliant testing method for Free & Total Chlorine when used with DPD strips, testing for Total Alkalinity, Bromine, Calcium Hardness, Free Chlorine, Total Chlorine, High Range Chlorine, Total Iron, Copper, Ozone, Permanganate, pH and more for 30+ direct read contaminants and over 40 tests total, can be easily done on the spot. Tests can be done repeatedly with lab test accuracy! 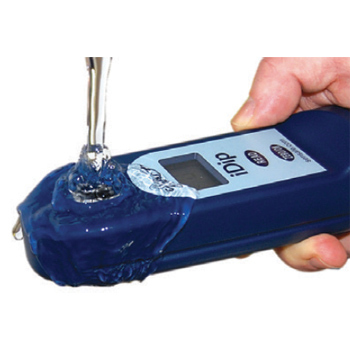 It's a great starter water tester for residential, commercial, pool and municipal water testing. 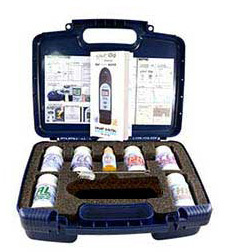 Requires test strips for each specific test (unit comes with a small sample of tests). See Replacement Parts section below or go directly to this page for available strips. 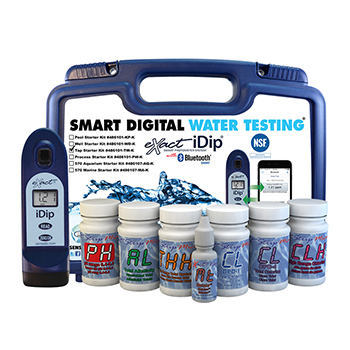 FilterWater.com offers these 2 different pre-configured kits: eXact iDip Tap Water Reagent Starter Kit and eXact iDip Well Driller Starter Kit, which comes with exactly what's needed to start testing. Packed in a rugged and durable plastic case with secure closing fasteners and padded compartment. 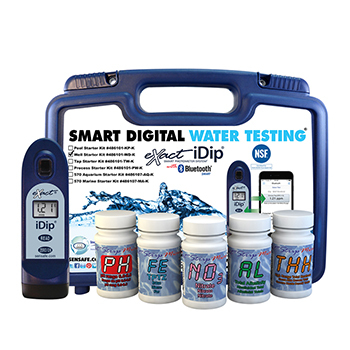 1 bottle 25 tests of each:Total Alkalinity, High Range Total Hardness, Free Chlorine, Total Chlorine (DPD-4) , High Range Chlorine, Metals, pH, Conductivity, TDS, Salinity, Temperature. 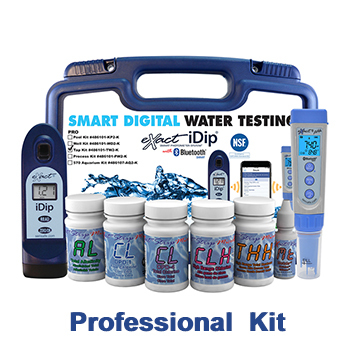 Test Specific Reagents(Over 35 available): * Ammonia, Bromine, Calcium (as CaCO3), Chloride/Salt, Chlorine Dioxide, Chromium Hexavalent, Free and Total Chlorine, Chlorine High levels, Copper, Cyanuric Acid, Hardness Total Low, Hardness Total High, Hydrogen Peroxide Low/Mid/High, Iodine, Magnesium Hardness, Nitrate, Nitrite, Ozone, Peracetic Acid, Permanganate, pH, Phosphate, Sulfate, Sulfide. 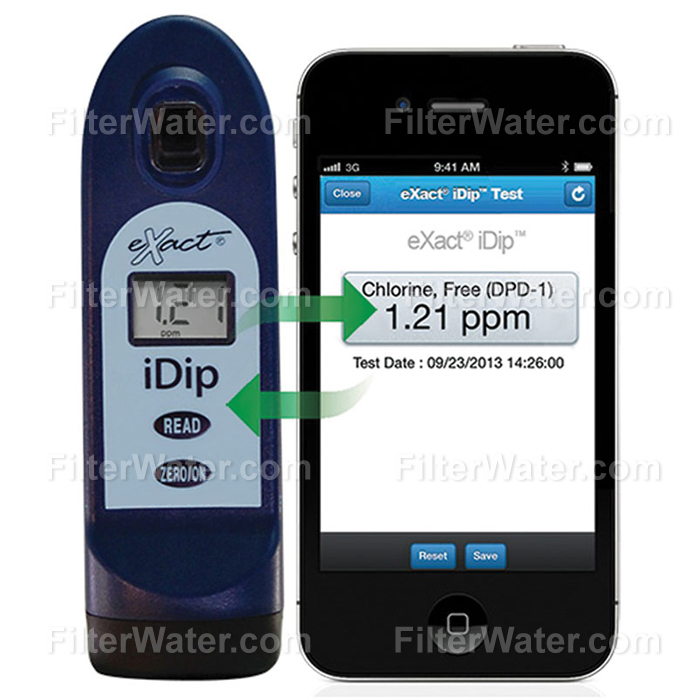 * More tests are coming and will be available via simple download to your mobile device! 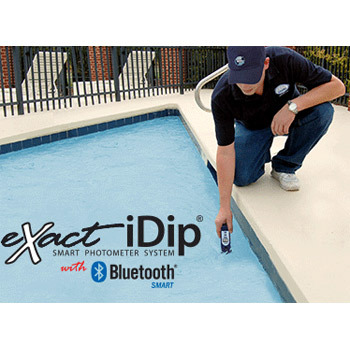 - Compliant meter for Free & Total Chlorine, uses 525 nm wavelength (US EPA compliance range is between 490 and 530nm). 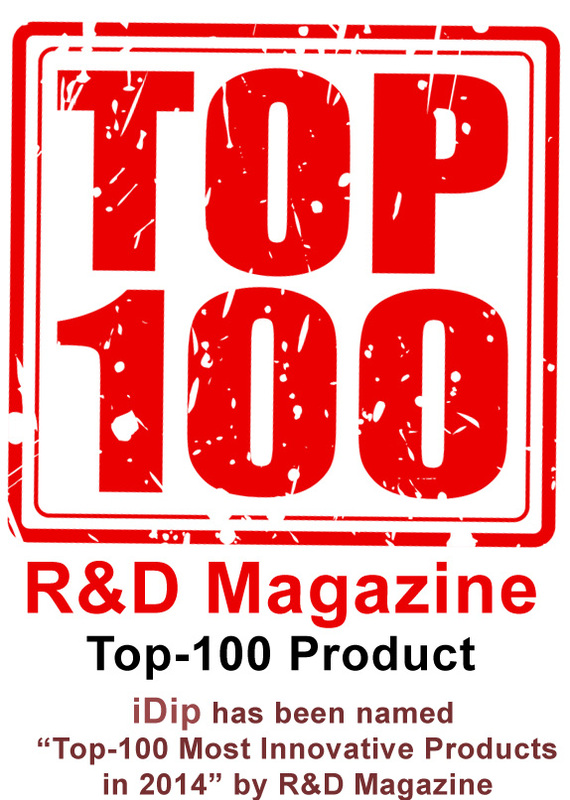 - Patented technology ( U.S. Patent No. 7,333,194 ). - Comes with a Manual in English, may be available in other languages, please inquire.